Mumbai is a city that is blessed by the rain gods for the most part of the year, and the glory of rains is best witnessed in the form of the milky white waters gurgling and cascading down the bountiful waterfalls in and around Mumbai. A visit to these waterfalls guarantees a sense of exhilaration that sweeps over you when you are enveloped in the laps of Mother Nature. The wilderness around these waterfalls adds to the nourishing experience. It’s time to jot down your itinerary for weekend getaways near Mumbai from the list of some amazing waterfalls in the area before the monsoon ends. 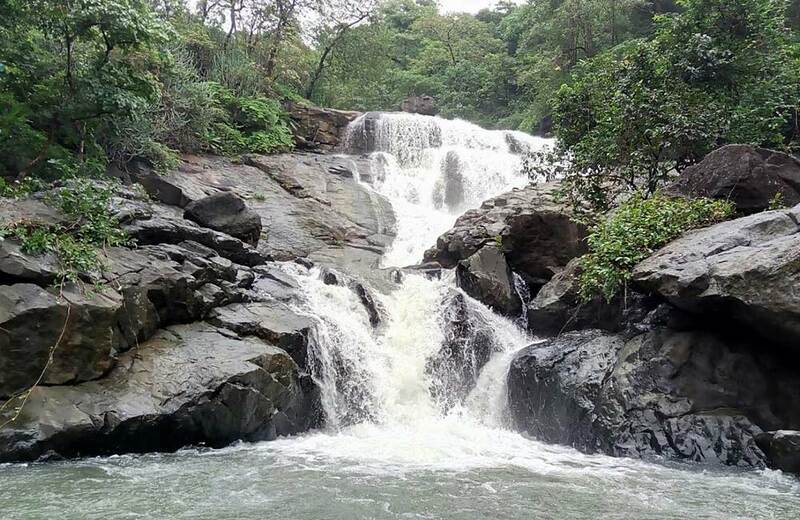 Pandavkada waterfall in Navi Mumbai gives you the best of both worlds. You get to have a wonderful day and you don’t have to travel a lot from Mumbai. Engulfed from all sides by the Pandavkada hills, these waterfalls are at a height of 107 meters and are a work of art. Feel the magic of nature reveal itself in its full glory while you admire the landscape. 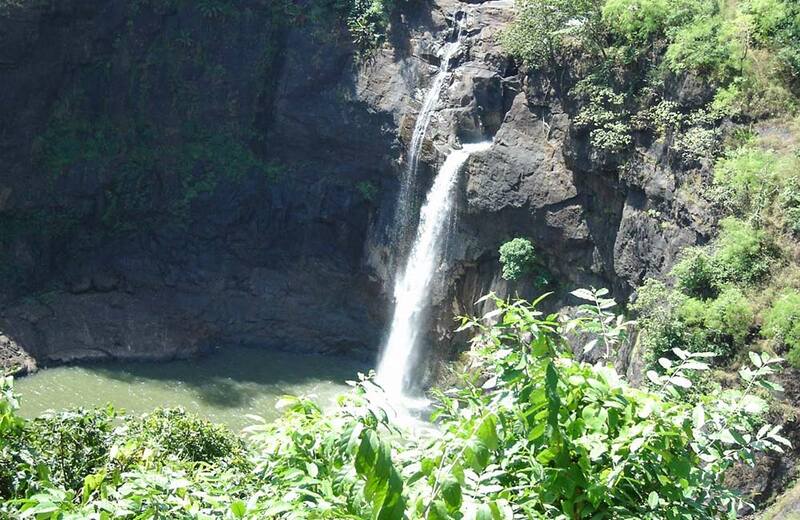 Another gorgeous waterfall in the National Forest area is Fanspada Waterfall Navi Mumbai, Maharashtra. Bhagirath or Vangani Waterfalls near Mumbai at Vangani, are not as famous as some other waterfalls but that is because its location is still unexplored. If you are looking for some quality time with your partner and some tranquility and serenity, then these waterfalls should be your pick for the day. There are several other waterfalls in the area which can be seen from the road, while you travel to Vangani, the only one accessible to people. The ambiance of this waterfall is sure to rejuvenate all your senses. Several nature and adventure camps take place at these falls on weekends and if you wish to try rock climbing and water rappelling near Mumbai among other interesting outdoor activities, then Vangani is the best choice. 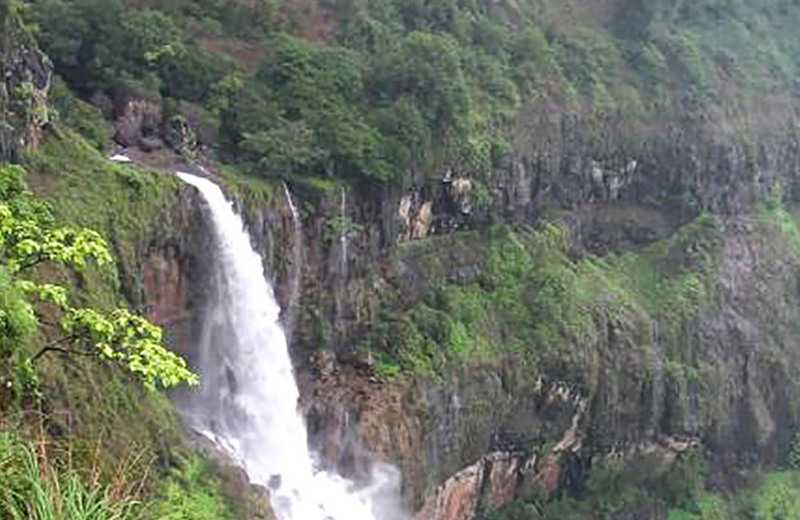 It is one of the best waterfalls near Mumbai for a one-day picnic. There is a small fee of ₹10 that is charged for visiting the waterfall and you can stay at the sight on till 5.30 PM. Located at Naigaon, Vasai, this waterfall is the favourite of Mumbaikars, especially on weekends, when it seems to be the hangout spot for most of Mumbai. This 100 feet high waterfall is in its full glory from June to October. 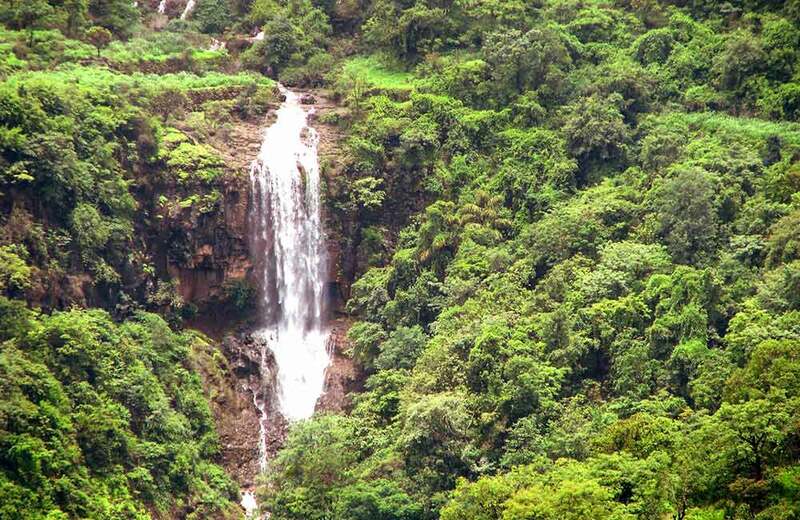 It is one of the top monsoon getaways and the preferred waterfall in Mumbai for one-day picnic for Mumbai folks. You can embrace nature at close quarters here by booking a trekking trip that takes you heading straight for the falls. Bhivpuri waterfalls near Karjat, are sure to give you a fabulous day out with friends and family. The salubrious surroundings make for a perfect picnic spot near Mumbai, especially in monsoons. Since it is quite close to Mumbai it serves as the perfect day getaway for the people longing to get away from the clamor of the city. This waterfall is set like a turquoise jewel in the emerald green settings of the valley. Bhivpuri Dam, a hydroelectricity power plant and a Sai Baba temple in the vicinity are also visited by people coming to this waterfall. Going to Khandala? Then you cannot come back without a visit to Kune Waterfalls which are at a short distance of 2 km from Khandala railway station. 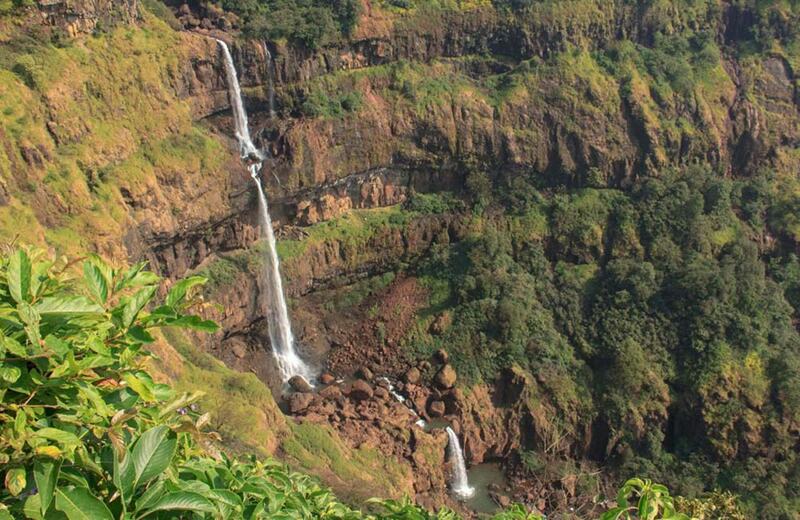 This three-tiered waterfall is set in the cloud-capped Sahyadri range and is at an altitude of 622 meters. Kune Church near the waterfall is also a stopover that you must take when going to these falls. Water flowing in full vigor at this cascade seems to play a symphony of its own and keeps you transfixed. The place is quite crowded, especially over weekends due to its proximity to Khandala and Lonavala. Located in the Sahyadri range, near Bhira village, Devkund waterfalls is one of the waterfalls in Maharashtra that continue to wow the people all year round. These waterfalls are a favorite among trekkers and hikers who love to spend some time in the verdant forests around the falls. Visitors often camp around the waterfall for a day or two to completely explore the area and to take in the fascinating view. Also known as Ashoka Falls, most people visiting the Nashik vineyards also take a trip to this waterfall. It is one of the many seasonal waterfalls in Mumbai that come to life only during the time between June and September. It is best to club a visit to this fall with your Nashik trip, as that would give you a chance to participate in the adventure sports like river rafting and rappelling that are organized here. You need to hike a little to reach this fall which is set deep within the forest, thus giving you some good avifauna sightings. Malshej is a picturesque hill station near Mumbai in the Sahyadri range and is the first name that pops up when you are looking at waterfalls near Mumbai. 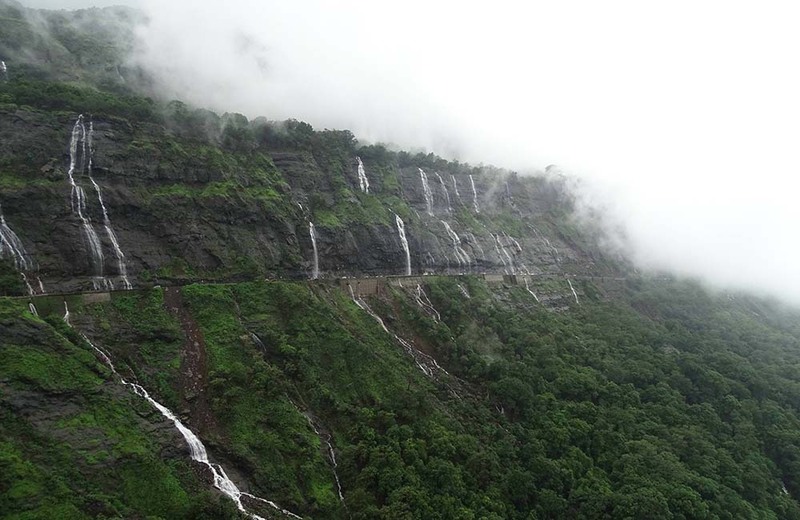 Malshej Ghat is home to many other waterfalls, with the most famous one being the Malshej falls that enhance the beauty of the lush green valley dotted with lakes. Monsoons here are a favorite stopover for the majestic flamingos from Europe, and can be seen in good numbers during this time. 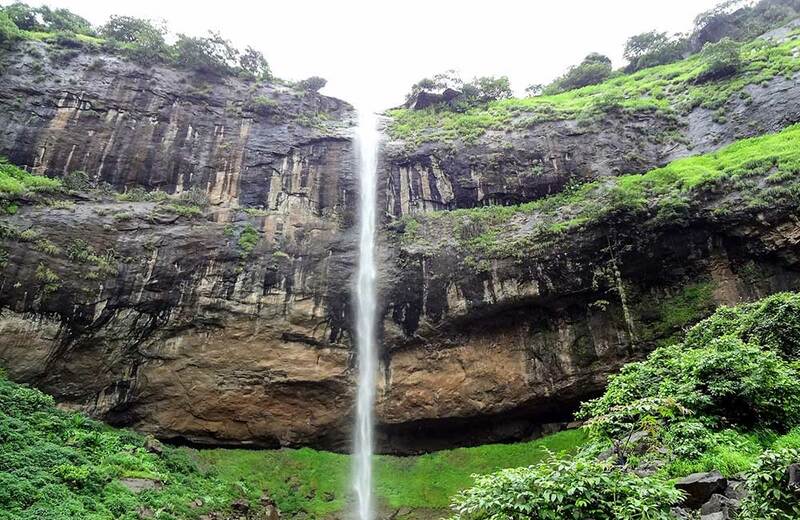 If you are on the lookout for picnic spots near Mumbai waterfalls, then, Malshej fits the bill perfectly, giving you hiking opportunities as well. This place is popular amongst insect lovers who join the trips organized by a Mumbai-based nature conservation body and hear the rustling of insects mixed with the gurgling sound of water. A majestic waterfall which forms the backdrop of an ivy-covered bridge, and the Bhandardara dam which serves as a perfect background to the waterfall, gives you the feeling of looking at a coffee book picture. Standing on the bridge, you can take some amazing pictures for your social media while admiring the gorgeousness of the falls. The falls have got their name from the way the water falls over a semi-circular rock, from the overflowing dam in monsoons, and cascades down like rain water does from an umbrella. 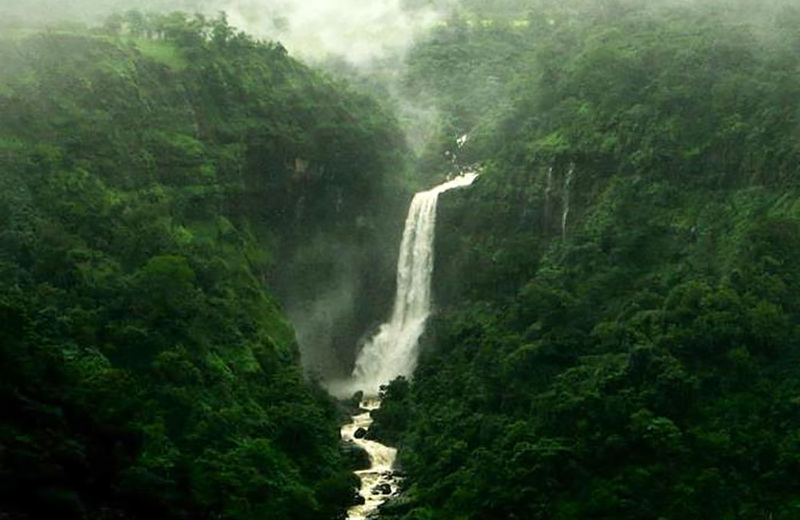 This waterfall is one of the best in Maharashtra for the splendid scenic beauty of the surrounding landscape. 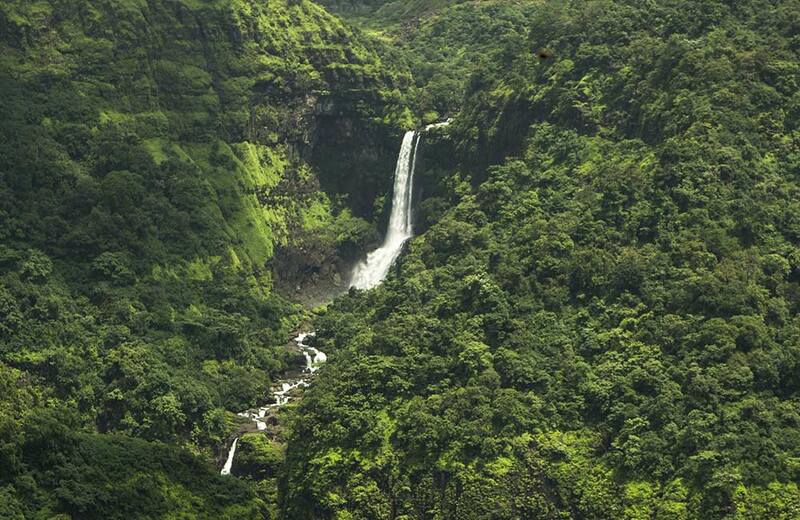 This waterfall is one of the best waterfalls near Mumbai when it comes to magnificence and grandeur. 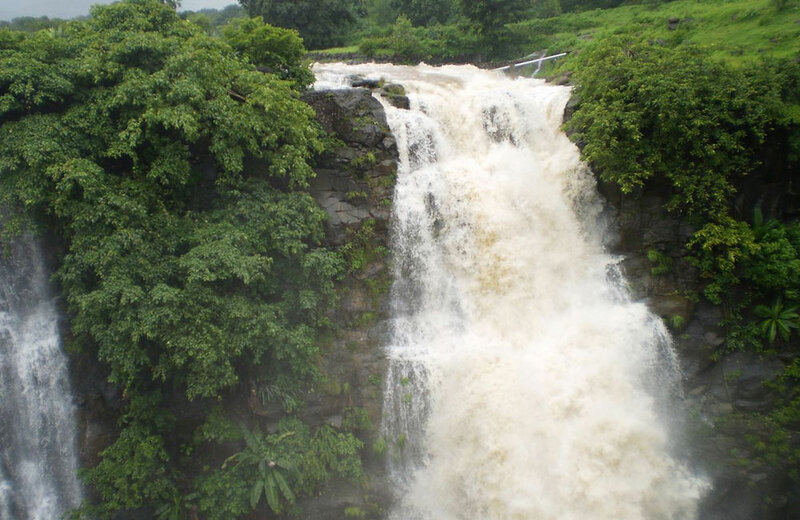 Randha waterfall is located on the Rajur – Bhandardara road in Ahmednagar near Igatpuri, and is a major source of hydropower; such is the force of the water. Overseeing Pravara River, the waterfall drops from a height of 170 feet into an equally beautiful gorge. 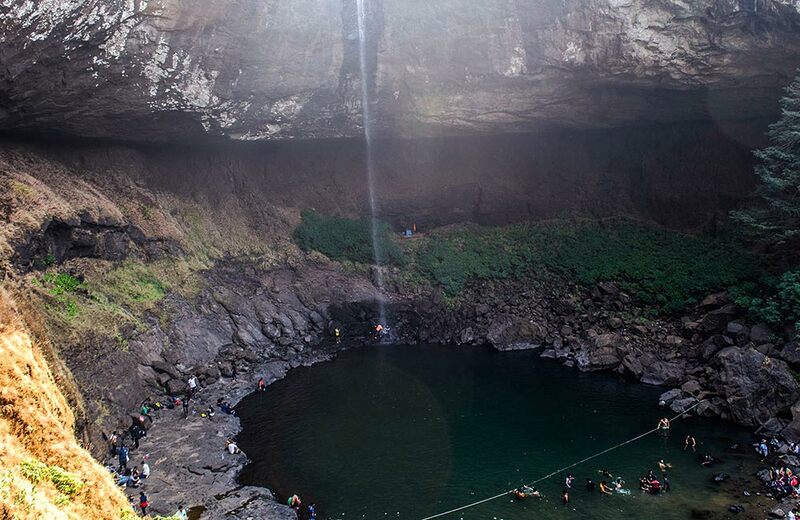 Randha falls is the third largest waterfall in India and the most popular one in Maharashtra. It is situated in the vicinity of a dense forest where you can go for a hike by paying a nominal fee. This waterfall is one of the best places to visit near Mumbai during monsoon to see the water cascading down gracefully, which is enticing enough for you to easily spend a day or two at this location. What you must not miss at this waterfall, is the temple on the banks of the river and the huge beehives hanging from the mountain ledges, which are best viewed from a distance for your own safety. Dabdaba or Dhabosa waterfall near Thane is around 18-20 km from the town of Jawahar in the Thane District, and is one of the best waterfalls in Mumbai, as it not only suits the city people in term of distance from the main city but it beckons adventure junkies and nature lovers alike. This waterfall plummets down into Lendi River from a height of 300 feet. 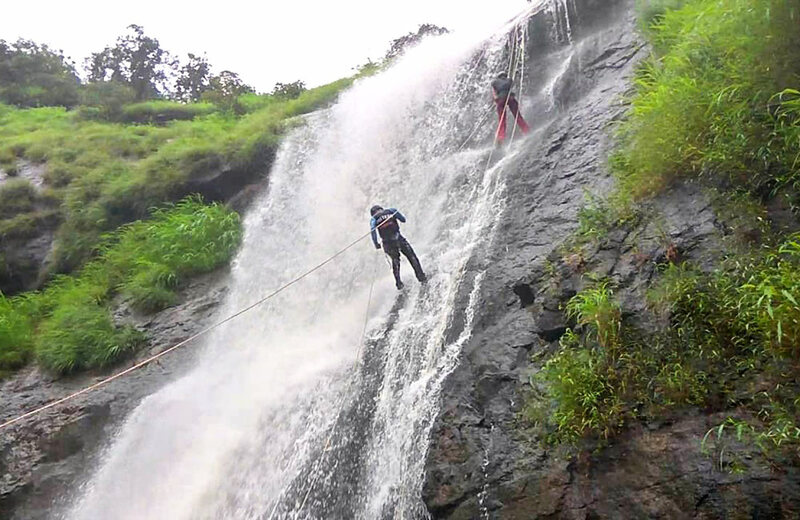 It is one of those places where you can try waterfall rappelling near Mumbai along with laddering, zip lining, kayaking, valley crossing, trekking, and fishing. The pool that is formed at the base of the waterfall is good for a swim. You can see the waterfall right from the spot where you park your car. 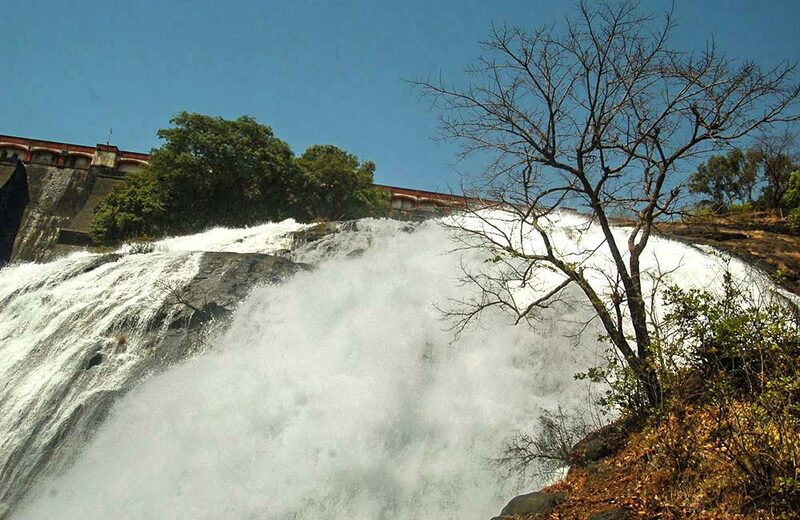 Enveloped in a rocky terrain from all sides, Dhobi waterfalls present a formidable yet majestic picture. These falls are at a little distance from Mumbai and make for a good weekend getaway when you can plan an overnight trip and stay at Mahabaleshwar for the night. 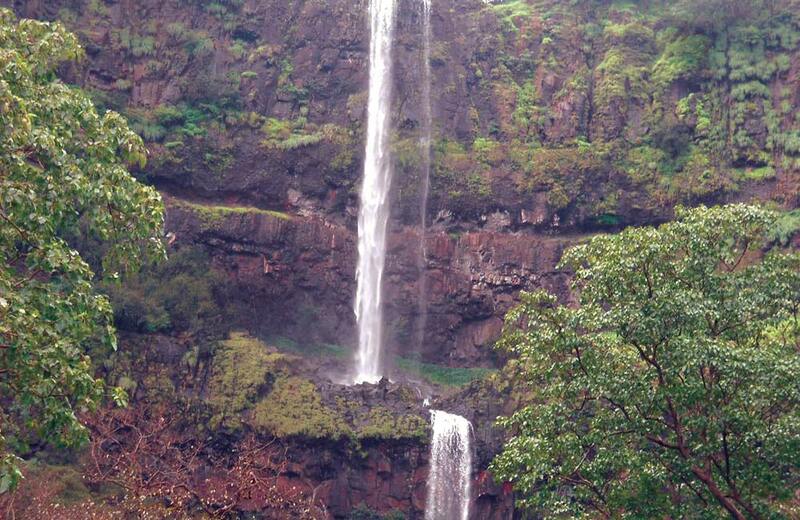 The waterfall faces the Elphinstone point which is a fabulous picnic spot. The best time to visit this waterfall is during the monsoons when it is brimming with water. Visiting the Bhilar Falls needs a bit of a planning since it can be enjoyed from when the monsoons begin, to the end of the year. You can plan a trip to Panchgani, one of the many hill stations near Mumbai, and make this waterfall a part of your travel plans. The falls are known by the name of the Bhilar village where it is located and is also believed to be only the source of Kundali River. It is a breathtaking sight to see the water cascading down from a height of 4500 feet. Mahabaleshwar is one of the most beautiful hill stations in Mumbai and if you are planning a trip to the place then your itinerary must include the Lingamala Waterfalls. 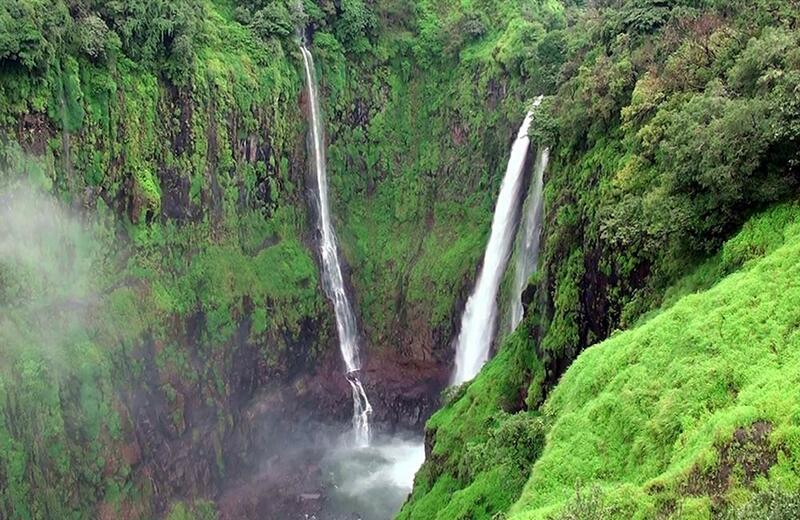 The breathtaking beauty of this hill station can be attributed to this waterfall which is at a grand height of 1278 meters, atop the Venna valley in the Satara district. Lingmala Waterfalls are formed by Venna River that flows in the area. There are two waterfalls in the area; the other one smaller than the Lingmala waterfall and cascading from a height of 500 meters. It is a walk of around half an hour from the small waterfall to the main one, but the walk is totally worth it for the marvelous scenery you encounter on the way. The waterfalls are on the Mahabaleshwar –Panchgani Highway and you can plan a longer than a day trip by including both Mahabaleshwar and Panchgani in your list of stops. The best time to witness the beauty of these falls is between July and October when it is in full bloom. This waterfall is also a popular picnic spot for its pristine beauty that is still untainted by civilization. The water here spirals down from a height of 500 meters and drenches you with a feeling of tranquility. Located in Thoseghar which is a small village at a distance of 20 km from Satara, these falls are set amidst dense foliage that lets you forget the worries of the concrete jungle. There are large grassy areas around the waterfall that serve as the perfect spot to lay down your picnic basket. A concrete platform in the area gives you a good view of the waterfall and the dense forest around it. 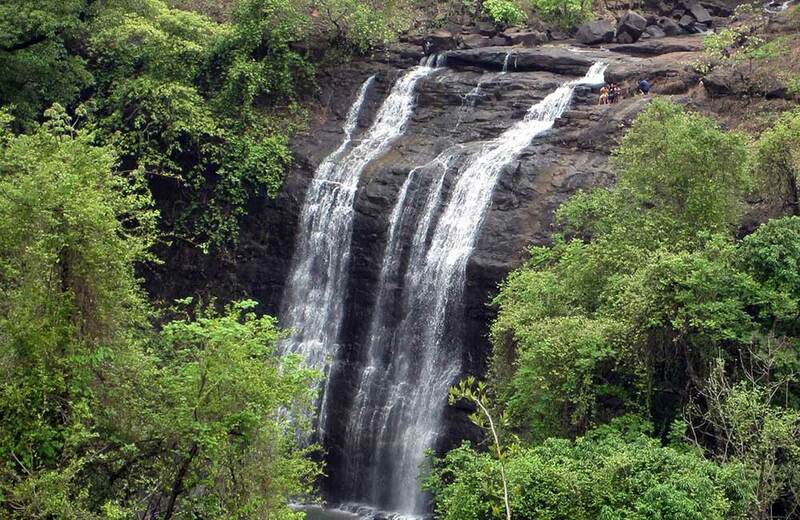 Though this waterfall is one of the farthest from Mumbai, it does not diminish its popularity in any way. It is situated in the Kas Flower Valley near Bhambavali village in Satara district. The place is frequented by travelers both from Mumbai and Pune. The three-tiered waterfall cascades from a height of 853 feet. It is said that this fall forms the origin point of River Urmodi. There are some caves in the vicinity that serve as a good place to have a little picnic. Swimming in the waters here is prohibited because of a large number of leeches in the area. Just when you thought Mumbai was all about the glitz and glitter, and people working day and night, this city presents you with some serene spots in the form of waterfalls, where you can unwind and connect with yourself and your closed ones. So do not wait too long, book a hotel in Mumbai and get ready for an expedition amid the lap of nature.